Lapsang Souchong Tea is a Chinese black tea native to the mountainous Wu Yi region, in the province of Fujian. Mostly enjoyed at breakfast, this is a tea that is strong, healthy and flavorful. What gives this tea its unique character? 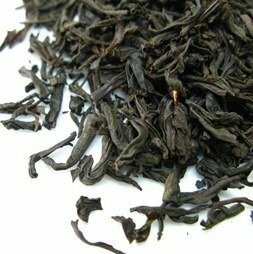 Large, dark twisted leaves make up this wonderful tea, but what sets it apart from all other teas is its amazing smoky flavor and fragrance. No other tea tastes or smells like this one and this is because it undergoes a special step during processing that makes all the difference. Come and have a sip of this strong Chinese black tea! 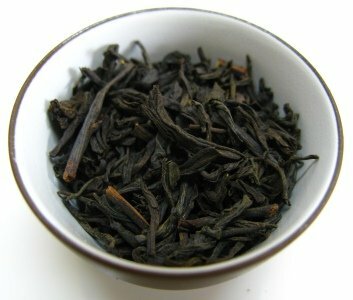 This Chinese black tea is unique in many ways, from its flavor, fragrance, origins and even in its name: Lapsang Souchong. Lapsang is the area around the village of Tong Mu Guan, in the Fujian province, where this tea was first created. Souchong refers to the tea leaves that are chosen. Whereas other teas use the buds and first two leaves (the Pekoe), this tea is made from the fourth and fifth leaf (the Souchong). These leaves are larger and older and have a different chemical composition. Stories differ as to how Lapsang Souchong was first created. During the Qing era, the Wuyi Mountainous region was known for producing great oolong teas. When a passing army delayed tea production, tea farmers decided to artificially dry the leaves over pinewood fires in order to speed up the process so as not to lose the whole crop and still make it to market on time. The result was quite unexpected: a smoked tea. The smoke from the firewood was absorbed by the tea leaves, greatly altering their fragrance and taste. Other versions of the story say that the army was actually invading the region and that the farmers resorted to this quick drying method so that they could move the tea and not have it stolen. Either way, the result was the same: this was one of the first black teas to be created and was much appreciated by Westerners. Today this tea is still produced and exported worldwide. Let’s take a deeper look at how Lapsang Souchong tea is processed. Today the process of Lapsang Souchong is replicated in tea farms in the Fujian region. Several steps are taken to achieve the same smoky aroma that tea planters stumbled upon in the 17th century. Large tea leaves are plucked for this tea in the second week of May. Low temperatures in the misty mountainous region account for the late harvesting calendar. Usually it is the tea buds and first young leaves that are used for black tea, but for Lapsang Souchong tea larger and more mature leaves are preferred, so the fourth and fifth leaves are plucked. Leaves are then set to wither with the aid of heat from burning pine firewood and once they become soft and lose their shine, the leaves are rolled into tight strips. Once rolled, the tea leaves are placed in wooden barrels so the oxidation may take place to turn these leaves into black tea leaves. Regular black tea would undergo a final drying stage and then be sent for sorting and packaging. Lapsang Souchong on the other hand requires a few additional steps: it is pan fried to stop the oxidation process and improve the aromas of the leaves. Again the tea leaves are rolled into their characteristic tight shape. This step allows for the leaves to release any final juices still trapped within, bringing flavor and strength to the surface. 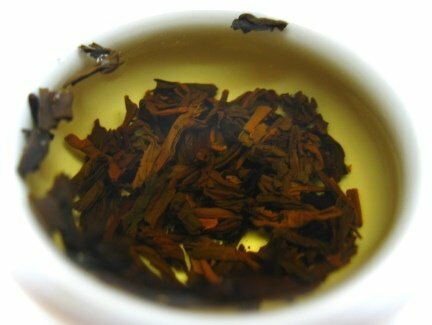 This is the stage that changes everything and gives Lapsang Souchong tea its unique smokiness. The tea leaves are set to dry in bamboo baskets over burning pine firewood containing a pine resin. As the leaves are almost dried, the fire is smothered producing an amber smoke that permeates the leaves. In the end, the tea farmer achieves a tea that is odorous and dark reddish in color, ready for packaging and exporting all over the world to serve at millions of breakfast tables. Lapsang Souchong is traditionally a Chinese tea, but with its growing popularity, other tea regions have started producing their own Souchong varieties. Chinese Lapsang Souchong - If you choose a superior grade genuine tea, grown in the Tong Mu village area, you get quite a special tea. 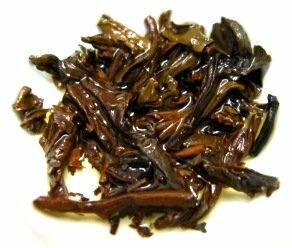 Tea leaves are lustrous and shiny with a reddish black color and an aroma of dried Logan. A high quality genuine tea is harvested for a brief period of time, which makes this tea rarer and more expensive. It also stands out from the rest for having a less smoky flavor and a sweeter taste. Tarry (Lapsang) Souchong – This variety of Lapsang Souchong tea is grown in Taiwan. It is considered the most extreme variety of this type of tea in terms of smokiness. Tarry Souchong gets its name from the fact that the final drying stage of this tea is done using burning pine tar, which gives the tea a stronger flavor and aroma, even more than the Chinese method. Now let’s take a look at the many benefits this Chinese black tea has to offer. Lapsang Souchong tea is rich in antioxidants, polyphenols, vitamins and amino acids that may be beneficial to you in more ways than just giving you the wonderful comfort of a hot drink. Black teas like this one may be great for helping you start your diet. A healthy way of losing weight is by improving your digestion and boosting your metabolism. A cup of this Chinese black tea helps your body to process foods faster, reducing the amount of fat that your body absorbs and getting rid of unwanted waste much faster, too. Unsweetened, this tea may serve as hydrating beverage to take on your workouts. Its caffeine content will help you feel energized and pumped for the physical exercise you need. Antioxidants present in black teas like Lapsang Souchong are said to improve your heart health and may reduce the risk of cardiovascular disease. Unsweetened, this tea may help to relieve your blood pressure and bring your bad (LDL) cholesterol and blood sugar levels down. This tea and a healthy diet may be the start to a healthier life. If you are searching for a strong flavored beverage that also contains caffeine, then the smoky notes of Lapsang Souchong tea may be for you. Not as high in caffeine as other black teas, this Chinese tea still contains enough caffeine to make it a good choice to help you feel energized in the morning. Caffeine in tea is released into the bloodstream at a slower rate than caffeine in a cup of coffee, but it may have a longer lasting effect and keep alert and focused for a longer period of time. If tea has caffeine then how come it makes you feel calmer when you drink it? This amazing characteristic present in Lapsang Souchong as well as other teas is due to the amino acid Theanine. Theanine is released from the tea leaves when you steep your tea. As you drink each cup what this amino acid does is calm you nerves, keeping you alert and yet focused. However, if you are highly sensitive to caffeine you may wish to read the next section. Lapsang Souchong tea contains antioxidants, polyphenols and vitamins that could help improve your defenses against harmful agents such as bacteria or viruses that can cause painful inflammation or infections. A strong immune system may also help your body fight the damaging effects of free radicals to your DNA and perhaps prevent the growth of tumor cells. As a black tea, Lapsang Souchong shares some common features with other teas of this type, so take a look at the benefits of black tea that these teas all share. Ready to enjoy a cup of this wonderful tea? Caffeine in tea is a concern of many tea drinkers and like all other teas this smoked Chinese black tea also contains caffeine. How much caffeine does this tea contain? The tea plant concentrates caffeine in the tips of the younger leaves and buds of the tea bush in hopes that this stimulant will drive way insects that like to nibble at the leaves. The fact that this tea is made from older, larger leaves and not the tips of the tea bush, means that there is less caffeine in this tea than other tippy teas, but it does contain caffeine suitable for a breakfast tea. Unfortunately, caffeine may stop being beneficial for you and may actually be harmful, if you either ingest too much or are too sensitive. This may not be the tea for you, if you start having a hard time falling asleep, feeling irritable and anxious, or if you begin to have headaches and heart palpitations. If you are pregnant or breastfeeding, make sure to check with your doctor how much caffeine you may ingest on a daily basis as too much may harm your baby. 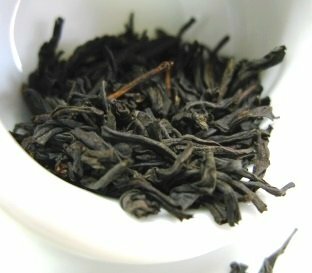 This is a very special tea with a unique smoky flavor, so take a moment to learn how to make Lapsang Souchong tea. The best teapot for Lapsang Souchong tea is a nice round porcelain one where the tea leaves can open up and swirl freely. Choose white teacups so you can better assess the color of the tea as you brew it. Place in the teapot one teaspoon of black tea leaves per cup of water (250ml/8oz). Bring good quality water to boiling point (100ºC / 212ºF) or just a few degrees under and pour it into the teapot. Let the tea steep for 3 to 5 minutes. As this tea has a strong flavor, you may wish to adjust steeping time, starting with 1-2 minutes and increasing steeping time to your liking. Pour this bright tea into your cup and feel the unique aroma of this smoked tea: it resembles pine soot. Take a sip and experience the mellow and thick flavor of Lapsang Souchong. Some say that this tea tastes very much like longan syrup. Because of its rather strong flavor, you may wish to add sugar and maybe even milk. Just remember to pour milk into your tea and not the other way around so that the tea does not cool down too much. This is a tea that you may enjoy at any time of the day, but it is said to be particularly good to accompany a savory breakfast. This is a great Chinese black tea that may be rebrewed a few more times. You just have to remember to increase the steeping time with each additional brew. Buy Your Lapsang Souchong Tea Today! Click on the image or on the link below to purchase from Twinings your Lapsang Souchong. Experience the wonderful smoky flavor of this lovely organic Chinese black tea. The unique way in which the tea leaves are smoked gives you an unforgettable tea. Buy your Lapsang Souchong Tea here! Journey to China and enjoy this wonderful healthy beverage that is Lapsang Souchong tea. Take a sip of a smoked Chinese tea!